"Rainy Days are coming and it's best to be prepared with bright colorful clothes that mask the drear grey sky. Whenever a dark day comes we tend to want to curl up and be comfortable... but that doesn't mean you can't do it fashionably! The polka dot rain jacket is perfect for the rainy season. Not only is it adorable but also the color will match just about anything you want to wear it with. A perfect example are these bright yellow pants. Having colored pants for spring is so necessary because they are a great way to transition out of winter and into warmer weather. This umbrella is perfect for when you're feeling fun and flirty. Felix Rey co-founders Lily Raffii (Lily Raffii Band after marrying Doug Band) and Sulaika Zarrouk designed this umbrella that brings a fun vibe to brighten up a cloudy day. 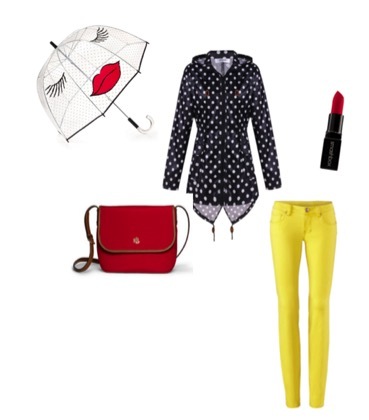 Adding a pop of color with red lips helps tie the umbrella into the whole outfit. This Ensemble is ideal for when you are out doing your weekly errands. Crossbody bags, like this one by Ralph Lauren, are great for those occasions when it's just easier to be hands free. Finish off your look with a swipe of your favorite red lipstick and you're on your way to conquer the day and stay dry!" I particularly love this ensemble. It is bright, chic, and would add that sunshine that I would need on a rainy day. 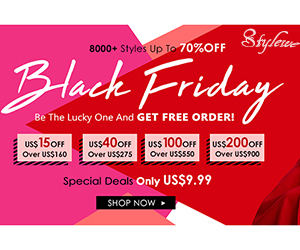 I absolutely love the Polka Dot raincoat, and the best part is that it comes in many colors, and is very affordable at less than $25. I know I would totally rock this! What are your thoughts? What do you think about the ensemble? Would you rock it?